Ports and terminals in both Denmark and Norway mostly had a good 2013, while many are expanding in anticipation of further growth. The centrally located Danish Port of Grenaa, for example, has published an ambitious expansion plan, which will be implemented in full by 2030. The need to add to existing facilities has been driven by substantial growth in traffic over the past ten years. The plan takes advantage of the introduction of a new bypass that will take heavy traffic away from the city centre and allow the growth of an established industrial area through the addition of a further 150ha. Industries that locate here will clearly be attracted by the close proximity of the port. Harbour infrastructure is to be expanded by 660,000m2 thanks to the introduction of a four-stage plan. Stage I will make use of opportunities afforded by the existing breakwater to add 165,000m2 of new quay. However, the real leap forward comes from Stage II, where infill of the sea will create 230,000m2 of operating area, a new swing basin with a 470m-diameter and draught of 15 metres, which will allow the port to handle Panamax vessels. Stage III aims to further extend the south harbour, adding 164,000m2 of quay, while the ambitious Stage IV will create a further 105,000m2 of infilled operating area. In 2013, Grenaa handled around 705,000 tonnes of dry bulk, which represented an increase of 8% compared with 2012. This came from both from organic growth from existing customers and also be attracting new business, says key accounts manager Kresten Peder Mehlsen. “For 2014, we expect to increase our dry bulk business even further due to the fact that we have invested in a new bulk- handling mobile harbour crane, which has a higher capacity,” he says. Grenaa mostly handles imported dry bulk, he adds, pointing out that main commodities are bio-fuels, metal for recycling and agribulk. The largest vessels using the port tend to be in the region of 30,000dwt, although will increase substantially once the new development plan is implemented. Although Grenaa does have a rail link, currently road handles dry bulk consignments. “Only a very small amount of our existing dry bulk could be said to be ‘captive’ to the port, although we are always on the look out for new commodities, which we hope will be attracted here once we begin to implement our new development plan,” he says. Grenaa Bulk Terminal (GBT) was acquired by Fredericia Shipping and Copenhagen Merchants in 2010, having been originally built to store and bag wood pellets. The facility has a 1,000 bags per hour capacity, with an integrated bagging line being fully automated. Other bulk goods such as fertilizer and salt can be bagged as well, in sizes from 5kg to 40kg. “Although it is our firm intention to continue handling wood pallets in Grenaa, we have also invested in other equipment to also allow the terminal to handle other bulk commodities such as grain,” says director Johnny Nielsen. GBT has approximately 10,000m2 of warehouses, in addition to a licensed weighbridge. The warehouses can hold approximately 35,000 tonnes of bulk and 5,000 tonnes of palletized goods. As for the port, it can load and/or unload up to 500 tonnes per hour. In 2013, the terminal reported traffic amounting to 140,000 tonnes, roughly a 20% increase compared to 2012, which Nielsen attributes to an increase in biomass business. For 2014, he predicts a further increase of 10–15%, although warns that this depends on the state of the market. GBT, he adds, mostly handles imported biomass products, but does also have some grain export traffic. Vessels conveying biomass tend to be quite modest in size, being in the 4,000–8,000dwt range, although the largest visitor to the terminal last year came in at 35,000dwt, with the state of the market at any given time dictating consignment size and hence that of the vessel needed. As for landside movements, most cargo for inland use leaves the terminal by truck, while other consignments make use of short sea vessels, Grenaa acting as a transshipment hub. Nielsen calculates that around 90% of existing cargo flows would naturally gravitate to the terminal, but says he is open to handling any new commodities if the market need is there. Fredericia Bulk Terminal (FBT) is one of Denmark’s largest and most automated dry bulk terminals. It consists of 12 individual storage compartments with a total storage area of 14,000m2 able to warehouse around 70,000 tonnes of grain, feedstuffs, wood pellets, fertilizer and so on. All compartments have 6m-high pressure proof walls, while the majority also have automatic top filling and semi-automatic emptying via underground conveyors. Filling and emptying capacity is typically 300tph (tonnes per hour). Automatic temperature control manages the airing of the products in the compartments so that the quality of the product is preserved under the best possible storage conditions. A weigh bridge is also able to ensure optimum documentation and control takes place as consignments move in and out of the terminal. At both Fredericia and Grenaa, which parent company Fredericia Shipping also operates, bagging lines are also in place for use with grain, fertilizer, wood pellets, salt and so forth in 5–50kg plastic bags. Capacity is in the order of 1,200 bags per hour. Additionally, the screening of wood pellets can also take place prior to delivery or before bagging via the terminal’s own silo batteries. Interestingly, Fredericia Bulk Terminal will also load 20ft oceangoing containers with grain, for which it has a capacity of about 1,000 tonnes per day. Additionally, the screening of wood pellets can also take place prior to delivery or before bagging via the terminal’s own silo batteries. Vessel loading and discharging is performed using the company’s ship loader or by crane grab with a capacity up to 600tph directly to and from the storage compartments. In 2013, FBT handled about 650,000 tonnes of dry bulk cargo, compared to 800,000 tonnes in 2012. According to terminal director Johnny Nielsen, the decline was primarily due to a downturn in the export of grain caused by a combination of factors: a poorer than expected harvest and the world market price for grain. “For the current year, we expect to see little change in the tonnage handled, although this, once again, depends on the world price for grain products,” he says. In addition, winter temperatures also have an influence on the turnover of dry bulks such as biomass, which is one of FBT’s major commodities. In general, the colder the winter, the higher the demand. As for capacity, the investment made in automation and the concomitant increase in capacity, means that FBT is fully ready to handle any future growth, says Nielsen. In general, the largest vessels calling at FBT are around 90,000dwt, although the normal range can be anything between 3,000dwt and 65,000dwt, the size of the vessel deployed being dictated by the market. Because of infrastructure limitations, the vast majority arriving or leaving the port does so by road. Kalundborg is one of the major grain exporting ports in Denmark. Kalundborg Bulk Terminal (KBT) handles about 500,000 tonnes a year of mainly export wheat and barley, although other bulk products passing through the terminal also include imported biomass for fuel, gypsum and fertilizer, while furnace ash is also exported. The main focus of the port’s traffic is the island of Sjaelland, from where consignments are moved exclusively by the road haulage industry. trucked using a tugmaster to Kalundborg Container Terminal for onward shipment, which is in the form of a weekly feeder vessel to the continent (usually Hamburg or Bremerhaven). 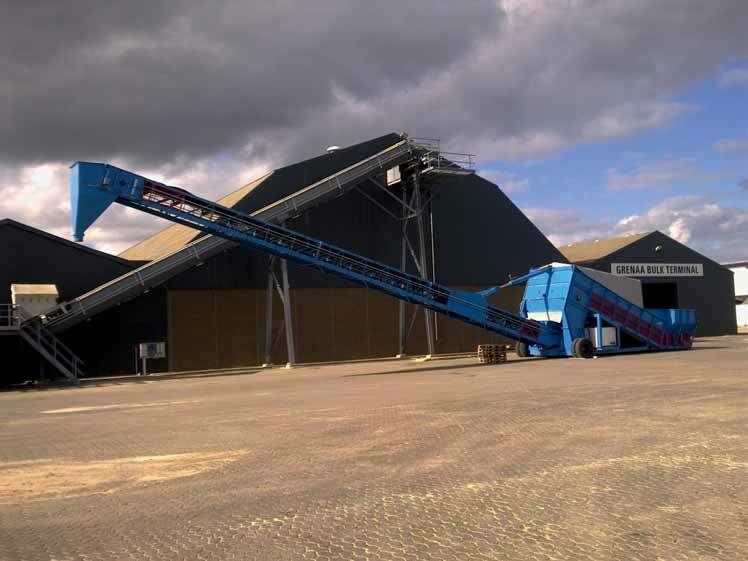 Imported biomass is handled in the same way, although emptied at KBT into bulk storage or sent to the bagging plant. KBT is part of Schultz Shipping, which also operates Kalundborg Container Terminal (KCT), hence the company has the necessary know how to accommodate more containerized bulks in the future. “In terms of how much tonnage we ship, the quantity that we handle is determined by the annual harvest, which can vary from one year to the next in terms of quality, quantity and associated trade patterns,” says Jakobsen. KBT is also able to add value to the basic commodities handled, he stresses, pointing out that the terminal also operates a fully automatic bagging plant capable of placing grain, salt and fertilizer into big bags, small bags and sales packaging. In addition, there are also several dryer systems in operation, which can process above 100 tonnes of product per hour. Associated Danish Ports (ADP), which has operations in the ports in Fredericia, Nyborg and Middelfart, handled 1.3mt (million tonnes) of dry bulk in 2013, which is identical to the volume reported for 2012. Indeed, for 2014, sales and marketing manager Ole Haugsted Jørgensen predicts similar throughput to last year. “At the moment, we have sufficient capacity to handle any further growth in dry bulk. In the meanwhile, to cater for longer-term growth, we are working on a strategy, which includes an overall masterplan for all our ports,” says Jørgensen. ADP mostly handles imported dry bulk, these being agribulk (feedstock/grain), biofuel (wood pellets and chips), aggregates and salt. Grain is the company’s largest export commodity. In terms of vessel size, those conveying salt inbound from Australia tend to load consignments of up to 72,000 tonnes and having a DWT of 78,000 tonnes. “The different commodities make use of a range of vessel sizes. We used to receive wood pellets from the Baltic and Scandinavia in smaller vessels, but due to growing demand, we are now sourcing these from the US, thereby using larger vessels. For example, we recently discharged two vessels each carrying consignments of approximately 30,000 tonnes of wood pellets,” says Jørgensen. ADP offers a water depth of 15 metres, allowing most vessels deployed in its region to call there. Quayside lift consists of six portal cranes and six mobile harbour cranes, so several cranes can be deployed on individual vessels. Most dry bulk cargo leaves by truck, but some transshipment of cargo to smaller vessels is undertaken, too, especially involving wood pellets. Quizzed as to how much of its existing traffic is effectively ‘captive’ to the port, Jørgensen points out that Fredericia is a regional port with a large hinterland, being the only facility to serve this area offering draught of up to 15 metres. This means that most overseas cargo to/from this part of Denmark is naturally handled via Fredericia. The Danish port of Aabenraa handled 1.2mt of dry bulk in 2013, compared to just 877,000 tonnes in 2012. Port director, Henrik Thykjær, predicts that for 2014 this figure will increase to 1.3–1.4mt, based on an increase in construction materials. “We are operating at the limit of our capacity, which is why we are planning to expand the port by about 40,000m2,” he says. Ninety percent of the dry bulk handled at Aabenraa is imported, with the average size of vessel being a modest 12,000dwt, although the largest can be anything up to 34,000dwt. Dry bulk consignments exit the port by road. “The main explanation for the increase is shipments of hazardous waste and contaminated soil en route for treatment and deposit,” says the port’s terminal adviser, Carl Johan Hatteland. For the current year, he estimates that volumes will be broadly similar, although various construction projects in the pipeline may strongly influence traffic in the next few years. There is, however, capacity to handle further growth, in particular as the cargo port is to be restructured in the coming years. “Oslo is mostly an import/unloading port. The majority of dry bulk being unloaded is also domestic in nature, for example, being sand for concrete or tarmac/asphalt and hazardous waste/contaminated soil. The main other dry bulk commodities are salt, grain, fertilizer, scrap and cement,” he says. The largest dry bulk vessel calling at the Port of Oslo in 2012 was the 9,822dwt FINEX, although the average for the year was in the region of 4,300dwt. Different commodities, notes Hatteland, require different sizes of vessels. “Although, in the main, vessel size is dictated by markets, there is also a sub-sea ridge in the Oslofjord that effectively limits draught to around 11 metres,” he adds. Neither rail nor inland waterway are a factor in dry bulk transfer at the port, with all landside movement of consignments undertaken by the road haulage industry. Quizzed as to what percentage of existing dry bulk traffic is ‘captive’ to the Port of Oslo, Hatteland notes that there are many ports in the Oslofjord, while few dry bulk products could therefore said to be ‘captive’. Finally, asked to comment on potential new commodities, he concedes that several relevant commodities are at different stages of consideration. The first LNG (liquefied natural gas) import terminal in Finland will be built at the Port of Pori. LNG gives more options to shipping companies, but it is also an optional energy source to heavy industry. The operational conditions of heavy industry using the Port of Pori for their dry cargo transport will be strengthened as a whole. The company Gasum Oy has decided to start a project aiming to build a LNG import terminal to Tahkoluoto harbour. The capacity is planned to be 30,000m3. The terminal will serve bunkering of vessels on the coastline between Hanko and Kokkola, as well as industry in the hinterland of the Port of Pori.The terminal is planned to be completed in autumn 2016. Gasum Oy has submitted an application to the Ministry of Employment and the Economy for investment funds for the LNG terminal. Therefore, no final investment decision has been made on the construction of the Pori import terminal. Gasum has nevertheless begun initial earthwork at the site of Tahkoluoto oil and chemical harbor. Gasum Oy is a Finnish company which deals with energy trade, transmission of energy and energy services. Gasum will acquire the majority of Norwegian Skangass’s distribution operations from the Lyse Corporation. Corporate acquisition makes Gasum largest Nordic LNG operator. The new emission regulations for sulphur dioxide coming into effect in 2015 will increase the need for cleaner fuels in marine traffic in the SECA (sulphur emission control area). SECA includes the Baltic Sea, the North Sea and the English Channel. Improving the availability of LNG will serve not only marine traffic but also the increasing needs of industrial clients outside the natural gas grids and future needs of heavy duty traffic. Gasum Oy and chemical company Sachtleben have made a deal on the delivery of LNG to the Sachtleben’s plant situated 12km inland from Tahkoluoto harbour. The gas will be delivered from Tahkoluoto to the plant by using a gas pipeline. When the pipeline is built, other industrial users along the pipeline will also be able to use LNG. The City of Pori, business development company Prizztech Oy and Gasum Oy have started co-operation to acquire new industrial users of LNG along the pipeline. The LNG pipeline will go via the M20 Industrial Park which is situated in the Port of Pori and in the immediate vicinity of the port. M20 Industrial Park is divided into three different functional areas: to industrial, logistics and value-added areas of Mäntyluoto and Tahkoluoto and to the recycling park of Peittoo. The M20 area is one of the few industrial and logistics areas in Baltic Sea Region that still offers space for growth to both small and large companies right next to a general port handling all kind of cargoes. There are over 200 hectares of vacant land for business sites and most of the sites are shovel-ready i.e. ready for construction. Sites are a good distance away from residential areas yet close enough to Pori, a city of 120,000 inhabitants. The Pori region is well known for its heavy industry. Energy and metal clusters are the main industrial clusters of the Pori- region. Nowadays about 1mt (million tonnes) of concentrates come from overseas each year, and are unloaded in the Port of Pori for the use of primary metal industry. The Port of Pori has a strong focus on mining and metallurgy in its strategy. Tahkoluoto harbour could be an ideal site for refinery of ores coming from the mines situated in the northern parts of Finland and Sweden and the refinery could use LNG in its processes, summarizes port director Jaakko Nirhamo. The M20 Industrial Park is being developed into a junction with excellent traffic connections to all over Finland as well to Russia, Scandinavia and continental Europe. Finnish heavy industry is mainly located in the belt which starts from the west coast and reaching the Russian border in the east. The Port of Pori is the westernmost point of this iron and timber belt. In this belt are located the most industrialized cities in Finland. The Helsinki Metropolitan region is the home base for the headquarters of industrial companies, but production is not done there. It is done mostly in the iron and timber belt of Finland. Main Finnish industrial areas and the largest cities can be reached within three hours by road. From the Port of Pori, there is also a railway connection to Russia. Finland has the same railway gauge as Russia. Rail wagons only need to be loaded or unloaded once. Extra lifting costs are not incurred. The Port of Pori is active to develop the transport connections in EU projects. The availability of LNG would give also new perspective to developing projects. The port is seeking companies to pilot greener heavy traffic on roads and railroads. The Port of Pori has the deepest fairway in the Gulf of Bothnia, which is the sea area between Finland and Sweden. The depth of the fairway to Tahkoluoto deep harbour is 15.3m. In terms of draught, all vessels that pass the Danish Straits are able to call at Tahkoluoto. In Mäntyluoto harbour, there is a new 12m berth and fairway for Panamax vessels. For example, 3,500 TEU container vessels can be handled in Mäntyluoto. Fairways are easy to navigate due to the lacking archipelago. The Port of Pori is also the best winter port in Finland. Capesize vessels call at Pori even in December. During a normal winter, icebreaking assistance is not needed. Port of Pori’s dry bulk handling infrastructure is in good shape. Much attention has been paid to the environmentally friendly handling of dry bulk. Dry bulk product creates dust, so in Tahkoluoto there is a closed loading system to prevent dust emissions. Other conveyors are also covered. Due to the economic crisis in Europe, the Port of Pori handled only 4.3mt of cargo in the year 2013. On average, the annual amount of cargo handled is over 5mt. According to tests, the capacity of the port is 10mt with present infrastructure and cargo handling equipment. In Mäntyluoto dry bulk, scrap metal, sawn timber, project cargo and containers are handled. There are also ro-ro (roll-on/roll-off) facilities. In Tahkoluoto there is a deep harbour for dry bulk and chemical harbour for chemicals and oil products. New cargo flows are emerging. The newest breakthrough besides LNG is the handling of soya beans. The harbour’s 15.3m draught enables access for Capesize vessels. The loading capacity is 1,200tph (tonnes per hour), and unloading is approximately 2,000tph, depending on the commodity being handled. Reshipping is also possible. The oil and chemical harbour operates in a separate area in Tahkoluoto. The annual traffic turnover is about 800,000 tonnes. Freight traffic consists of different oil products and chemicals.The area accommodates cisterns owned by private oil and chemical companies. A new quay was opened in the oil and chemical harbour in October 2008. The quay makes it possible to separate flammable and non-flammable products, increasing loading and unloading capacity, as well as safety at the port.